3Prof. Dr., Çukurova Üniversitesi, Göz Hastalıkları ABD, Adana, Türkiye Objective: To analyze the outcome of pneumatic retinopexy (PR) for repair of rhegmatogenous retinal detachment (RRD). Materials and Methods: Medical chart of patients who underwent PR for RRD were retrospectively reviewed. Visual acuity, lens status, localization of the detachment, number of breaks, the duration of follow-up, and the demographic data were assessed. C3F8 gas was injected in all cases. In cases PR failed, the patients underwent pars plana vitrectomy. Patients with a follow-up of below 2 months were excluded. Results: Twenty-one eyes of 21 patients (14 males, 7 females) with a median age of 59 (18-68) were included. Eight cases were pseudophakic and 13 were phakic. Preoperative visual acuities ranged between hand motions and 1,0. The median detached retina area in clock hours was 4 (2-7). In 19 cases, only 1 break was detected preoperatively. 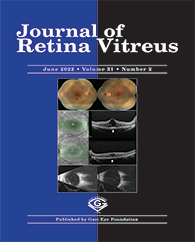 Peripheral retinal laser photocoagulation (360 degrees) was applied in 18 cases. 360-degree laser photocoagulation was signifi cantly associated with successful outcome. Reattachment was achieved in 13 (61.9%) cases. No PR-related complications were encountered.